On clay, at home, one would have to be insane to bet against the Spaniards repeating as Davis Cup champion. Although the Czech Republic proved to be a worthy opponent, logic prevailed. Spain secured the initial three rubbers to become the first country since Sweden in 1998 to successfully defend the trophy. Yesterday, in the first rubber, Rafael Nadal faced Tomas Berdych. At five all in a tight opening set, Nadal finally broke to gain the upper hand. With nothing left to give, Berdych capitulated, Nadal won 7-5,6-0,6-2. 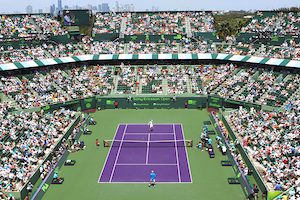 The second match of the day was a barn burner as Radek Stepanek tangoed with David Ferrer. At first glance, captain Albert Costa’s choice of Ferrer over Fernando Verdasco, Spain’s second best player and world number 9, seemed odd and a colossal mistake. Ultimately, it turned out to be a masterful gamble. After Stepanek crushed Ferrer to carry the first two sets 6-1, 6-2, the Czech Republic appeared on its way to a tie, which would have made it a seriously competitive final. The only difficulty was that Ferrer had no intention of soiling his unblemished Davis cup clay court record. The Spaniard fought back taking the next two sets to push the match to a decisive fifth. Early on, Stepanek had opportunities to get the break. But, each time Stepanek got close, Ferrer shut the door. More than four hours into play, a string of errors by Stepanek allowed Ferrer to seize the break for 7-6. Ferrer went on to serve out the match and with a 1-6,2-6,6-4,6-4,8-6 victory, he remains undefeated on clay at 7-0. Needless to say, the doubles was a must win for the Czech Republic. With Stepanek probably a little spent from the previous’ day marathon match, Spain was already favored from the get-go. The tandem of Feliciano Lopez and Verdasco turned away Berdych and Stepanek 7-6,7-5,6-2. In the first set, after Verdasco riffled a forehand return up the line, Spain obtained a break for 3-1. However, with a couple of forehand mistakes by Verdasco, the Czech Republic erased the advantage. At 4 all, a great forehand winner by Berdych resulted in break point. But, with errors from their rivals, Spain guarded serve. So, the set was settled by a tiebreaker. With a spectacular return by Verdasco, Spain got a mini-break and stretched its edge to 6-3. After saving three set points, the Czechs earned a set point themselves. Still, the Czechs surrendered two consecutive service points, giving the Spaniards another set point. When Stepanek misfired on a volley, Spain bagged the first set. The second set similarly was hard fought with neither team having a bite at break point until 5 all. Serving at 40-15, the Czechs made two forehand miscues resulting in deuce. Subsequently, Berdych had a forehand volley sail long handing Spain break point. The Spaniards capitalized when the Czechs misfired on another volley. With a strong game, Lopez punctuated the set. With Stepanek’s serve wilting, the Spaniards opened the third set with triple break point. When Lopez thumped a forehand winner down the line, Spain obtained the break. Shortly after, Verdasco consolidated with an easy service game for 2-0. Again with Stepanek serving at 1-3, on Spain’s seventh break point chance, Verdasco gunned a forehand crosscourt winner extending the lead to 4-1. Up a double break, Spain cruised on serve as it went on to capture its fourth Davis Cup title this decade. Argentina’s chances of winning its first Davis Cup trophy in its third appearance were lofty. Firstly, it had home field advantage. Secondly, the surface selected was hardcourt. Moreover, with world number one Rafael Nadal unable to make the trip due to tendonitis, Argentina seemed blessed. But Spain showed that it is far from being a one trick pony. Spaniard Fernando Verdasco defeated Argentine Jose Acasuso 6-3, 6-7, 4-6, 6-3, 6-1 in the fourth rubber to take the title leaving thousands of boisterous Argentine fans stupefied. In Friday’s first rubber, Argentina got off to a flying start. David Nalbandian faced Spaniard David Ferrer with the former proving to be Goliath. As usual, Nalbandian’s backhand was sublime. 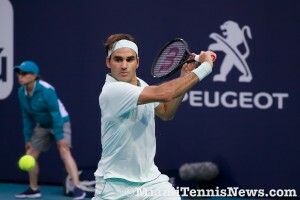 More impressively, his forehand was solid. He even came up with highlight reel volleys. Nalbandian prevailed 6-3, 6-2, 6-3 to give Argentina a leg up. Argentina maintained the momentum through the first set in the second rubber as world number 9 Juan Martin Del Potro squared off against Feliciano Lopez. Courtesy of one service break, Del Potro carried the first set. However, Lopez no longer feeling generous cleaned up his game and pushed the second set to a tiebreak which the Spaniard easily won. With neither player making inroads on the other’s serve, the third set also went to a tiebreak. Lopez recovered from a minibreak disadvantage to take the third. In the fourth set, after Lopez jumped out to an early lead with a break, Del Potro quickly effaced that advantage. Unfortunately, Del Potro sustained a right groin injury and despite medical treatment was unable to recover. His next service game, Del Potro went down love-40, and then double faulted to get back in a hole. 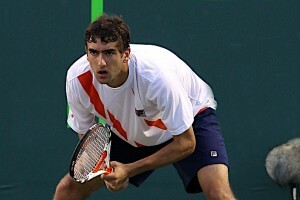 Ultimately, Lopez beat the young Argentine 4-6, 7-6, 7-6, 6-3. Saturday in the doubles, Argentine Agustin Calleri and Nalbandian took on Verdasco and Lopez. Argentina debuted well, needing a single break to take the first set. In the second, as Calleri served to force a tiebreak, he made some key unforced errors to help Spain carry the set. After stepping on the gas to get a 5-1 lead in the third, Spain sputtered. Argentina forced a tiebreak and was just two points from leading two sets to one. Spain battled back to prevent the home team from stealing the third set. In the fourth set, Spain pulled away as a stunned Argentine public looked on 5-7, 7-5, 7-6, 6-3. The feature match on Sunday was Acasuso versus Verdasco. Argentina was attempting to defy history since the last team to overcome a 2-1 deficit in the finals was Germany in 1990. Argentina’s was hopeful that despite not having played for months, Acasuso would force a decisive fifth rubber. After a sloppy first set by the Argentine which went in Verdasco’s favor, Acasuso capitalized on errors by the Spaniard to get ahead 4-1. But with multiple unforced backhand errors, Acasuso relinquished his lead. After a seesaw of breaks, the second went to a tiebreak which Argentina finally secured. In the third set, Acasuso tracked down an overhead from Verdasco and made a forehand winner for love-30. Then, a Verdasco double fault gifted Argentina the early break. Swiftly though, Acasuso returned the favor by double faulting to level the set. This back and forth pattern persisted until the tenth game when Acasuso finally consolidated a break to end the set. By picking on Acasuso’s weak backhand, Verdasco dominated the fourth and forced a conclusive fifth set. With three unforced errors, Acasuso faced love-40 in the opening game; Verdasco captured the break when the Argentine netted a makeable forehand. To aggravate matters, Acasuso suffered an abdominal strain. As the errors rained from the Argentine side, Verdasco took control of the fifth set and on the third break chance produced a forehand down the line for winner to cinch the title for Spain, the third this decade. Rafael Nadal booked Spain’s berth in the Davis Cup final by beating American Andy Roddick in the fourth rubber 6-4, 6-0, 6-4. The odds were stacked against the Americans, the defending champions, for various reasons. Firstly, they were playing on foreign soil. Secondly, two of their top players James Blake and Bob Bryan were unable to participate. But most importantly, they would have to face Spain on clay, a surface where the Americans are the least comfortable and Nadal’s pure genius has been proven over and over. Therefore, it was not surprising that after the first day, the Americans were in the position of playing catch up having lost the first two rubbers. This uphill battle began promisingly with American Sam Querrey winning the first set in a tiebreak 7-6 over Nadal. But that would be the only bright spot in the first match. A seemingly rusty Nadal even went down a break early in the second set. But the Spaniard came roaring back to take control of the second set and the match 6-7, 6-4, 6-3, 6-4. In the second rubber, Andy Roddick faced David Ferrer. The tide appeared to have turned for the U.S. as Roddick managed to get a two set to one lead after losing a tough first set tiebreak. Yet again, America’s luck proved fleeting as Spain stole the match in five sets 6-7, 6-1, 6-2, 4-6, 6-8. On Saturday, the U.S. stayed alive as the doubles team of Mike Bryan and Mardy Fish prevailed in spectacular fashion over Spain’s Fernando Verdasco and Feliciano Lopez 4-6, 6-4, 6-3, 4-6, 6-4. However, the pivotal match came on Sunday as Nadal squared off against Roddick. Initially, the American used his big serve effectively to keep toe to toe with the Spaniard. Nonetheless, serving at 4-5, Roddick lost his way allowing Nadal to take the set. 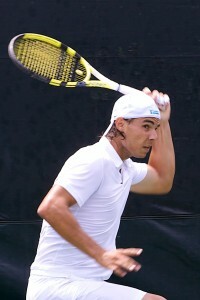 Thereafter, Nadal demonstrated why he has won four consecutive French Open titles. The clay master dominated, passing at will as Roddick tried to change things up by coming to net in the second set. Roddick attempted to stage a rally in the third set and had triple break point in the second game. Still, Nadal found the means to hold serve. The Spaniard then turned the tables, breaking the American at love the very next game. In the eight game, Roddick again found a slim opening at love-30, but it was promptly closed by Nadal. With a strong service game, Nadal put to bed the third set and assured Spain’s spot in the finals. The Spaniards also won the last rubber of the day with Lopez defeating Querrey 7-6, 7-6. Spain’s opponent will be either Argentina or Russia. The Russians will need to stage a come from behind charge as they find themselves down 2-1.